Keith’s note: On Thursday, 10 December 2009, we conducted a live webcast from the Lunar Orbiter Image Recovery Project (LOIRP) at “McMoon’s” i.e. Building 596 at the NASA Ames Research Park. Dennis Wingo and I give you a tour of our project including a walk through of the abandoned McDonald’s that has been our base of operations since 2008. We show you how we rack tapes, play them back, capture the data on a computer, and then stitch the image framelets together. You can look over our shoulders and see the imagery as it appears on one of our old TV monitors. We’ve picked an especially interesting tape to show you. Eventually this image will be posted online at LPI and submitted to the NSSDC. [Click on image to enlarge] Keith’s note: This image was taken on 21 November 1966 by Lunar Orbiter II at an altitude of 44 miles. The image is taken from frame 92, Framelet 445, and has resolution is 0.98 meters/pixel. As such the large boulder that has left a trail is around 6-7 meters in diameter. The image on the left shows the highest resolution image available online at LPI. On the right is the raw unproceesed image we retrieved this afternoon. While the large boulder’s trail is seen in both images, the details of that trail and the rest of the boulder field are much sharper in our newly retrieved image. By coincidence this large boulder is very similar in size to “House Rock” a large boulder north of the Haughton Mars Research Station on Devon Island. That’s me standing on top if it. This rock is a favorite place to pose for photos and was named after the large rock that Astronaut Jack Schmitt posed next to during the Apollo 17 mission. [Click to enlarge] Keith’s note: These images are taken from Lunar Orbiter II image LOII_092H1 Framelet 522. On the left is the highest resolution scanned version available online at LPI (or USGS). On the right is our partially processed version that we retrieved this morning. In addition to providing a much sharper image, note that our new image also allows contrast to be controlled such that features can seen in the areas that are darkened in the older image. Right now we are focusing on retrieving Lunar Orbiter II images at the request of both LPI and USGS since high resolution (modern) scans have yet to be done for this mission’s images. We hope to have the entire image online later today complete with collapsed lava tubes (?) and giant boulders sitting in the middle of otherwise flat plains. With our recently enhanced (restored) original FR-900 tape drive and its recently restored sister drive we will soon have two fully functional drives in operation and will be able to (eventually) retrieve and release images on a daily basis. I will be doing a live webcast tomorrow at 1pm PST wherein we give you a tour of our facility and watch as we pull a new image back from history and into the present. Details to follow. [Click on image to enlarge] Keith’s note: Tonight we are testing out our newest Mac computer at the Lunar Orbiter Image Recovery Project located at NASA ARC. We’ll be using this machine (8 processors and 10 TB of storage) to do near-real time processing of imagery once we have pulled it off of original Lunar Orbiter analog data tapes using our restored FR-900 tape drives. We hope to do a live webcast this coming Thursday so that you can look over our shoulders as we bring another image to light for the first time in more than 40 years. Tonight, as we were flying through a portion of one of the images we came across a boulder field. Here is the image archive at LPI – subframe H3, Framelet 323. 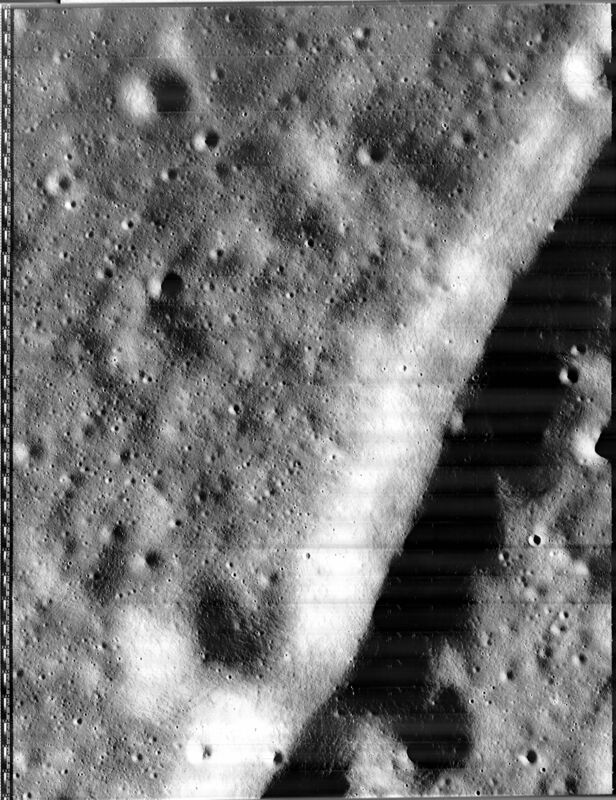 The image was taken by Lunar Orbiter II on 20 Nov 1966 at an altitude of 52.2 miles with a ground resolution of 1.14 meters/pixel. The framelet image shown here is approximately 220 meters across. You can clearly make out a number of boulders around 1 meter in size sitting on the surface. Keith Cowing at McMoon’s (Bldg 596) at the NASA Ames Research Park preparing to install five 2 TB drives in a new Mac that will be used for post-downloading image processing.